“When is something worth pursuing? 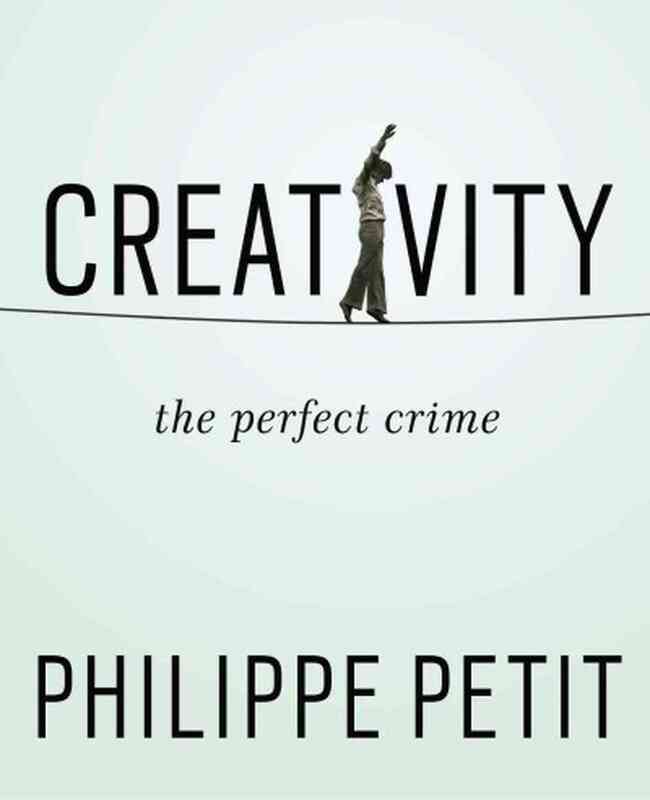 In his recent book, Creativity: the perfect crime, Philippe Petit reveals the elements, flows, techniques, and routines of his very long career as an artist. Petit is high-wire walker, juggler, magician, lock-picker, and all around street entertainer, perhaps best known for his walking between the Twin Towers of World Trade Center in the early 1970s. He’s currently (and intriguingly) artist-in-residence at The Cathedral of St. John the Divine in New York City. At once a mix of memoir, how-to manual, and an empirical-phenomenological exploration of the kinesthetic foundations of craft, Petit’s Creativity is inspiring and informative, revealing the inner life of a most interesting individual. Petit brings the reader into his world by drawing on his various performances or artistic “crimes” from over the decades, especially his wire walks, which require meticulous planning–from staking out locations, making plans and organizing equipment, rehearsing and setting up, to taking that first step out into the unknown. Each component of each performance is an opportunity to engage creativity and think rigorously through the act soon to be, to “toy with an idea until it becomes a fixation” (20). For Petit, a performance is a crime in the sense that it’s an opportunity to find “imperfections in the system…as tiny portals through which…to explore, to understand, to create” (22). Petit notices his environment because his attention is constantly fluttering about, observing, remembering, and interrupting. But Petit always goes with his own flow. The problem with paying attention, he tells us, is that “the seriousness of it will rarely allow for uncommon intellectual detours, for mental demultiplication” or what he translates as a reduction in gear ratio (97). The key is to trust that order will eventually emerge out of the chaos of deep perception. Petit even suggests the term sensefulness to describe blending one’s senses to make a new, composite meta-sense. Elsewhere, he encourages his readers to experiment by questioning their own work–and questioning the questioning–to create openings and provide connections (145), to experiment with “the mirror image of a concept” (163), and to notice the aliveness of seemingly inanimate things. “Inside the most ordinary objects” Petit says, “hide the richest creative opportunities, waiting to be awakened” (197). There’s a lot of detours in this book too. For instance, every so often Petit has a word in blue type (boldface on my Kindle edition) that leads, like a secret portal, to a mini essay on the topic elsewhere in the book. He also includes hand drawn illustrations of his idea lists, schedules, tools, performance and living spaces, and so on. The idea lists are particularly compelling, especially as Petit explains how he cross links the concepts and re-writes them to reveal new relationships. And yes, Petit talks about–and talks to–his tools (juggling balls, floppy hat, among other props), all as part of maintaining his life at a particular pitch and allowing it to be an ongoing ritual full of hidden meanings, his projects ongoing explorations of epiphany and getting into the zone. These are just the highlights. By turns maverick, playful, serious, and fearless, Creativity is a book to remind you how art can be a very, very special kind of intellectual and physical adventure story.